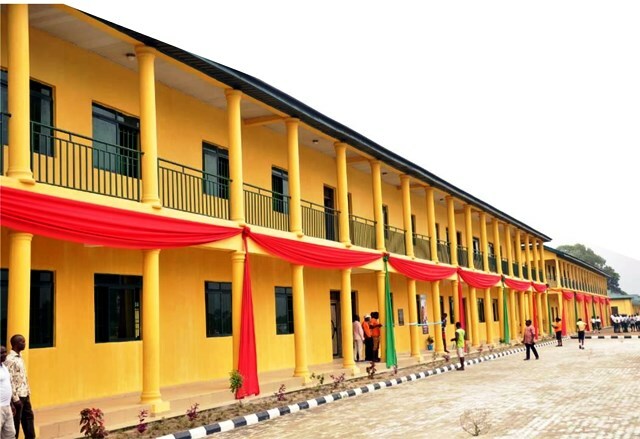 A building at the reconstructed Birabi Memorial Grammar School, Bori, commissioned by Governor of Sokoto State, Rt Hon Aminu Tambuwal, last Wednesday. 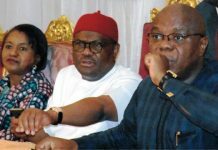 The Rivers State Governor, Chief Nyesom Wike has called on Ekiti people to stand firm and resist any attempt by the Independent National Electoral Commission (INEC) to manipulate their governorship election results. Speaking during the official presentation of flag to the Ekiti State PDP governorship candidate, Prof Kolapo Olusola Eleka, yesterday in Ado-Ekiti, Wike declared: “This is Operation Stay Where You Are”. He said on no account should the Ekiti people be intimidated by the use of security agencies for the purpose of manipulating the process. 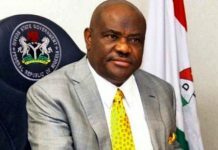 Wike said: “If they like, they should bring missiles, stay put and defend your votes. Stay put at the voting centre until the results are formally announced”. The governor added: “Everybody must be courageous and vigilant. Nobody should run away due to intimidation. Stay and demand credible elections because they don’t want to conduct credible polls. “They want to rig, but they must be resisted by the good people of Ekiti State. Look at the crowd, Ekiti State has been won by the PDP”. Wike assured the Ekiti electorate of the support and best wishes of Rivers people. The mega rally attended by national leaders, presidential aspirants and governors of the People’s Democratic Party (PDP) declared readiness to displace the All Progressives Congress (APC) from the Presidency. They sounded the 2019 general election battle cry at the mega rally in Ado-Ekiti where they rallied support for the party’s candidate, Prof. Kolapo Olusola, in the July 14 governorship election. Olusola was officially presented with the party’s flag by the PDP National Chairman, Prince Uche Secondus, at a rally staged on the highway at the foot of the flyover in Ojumose area of Ado-Ekiti, the state capital. Mammoth crowd of party members, workers’ unions, students, youths, artisans, ethnic nationalities and members of the public utilized the opportunity to attend the rally. Former Vice President and presidential aspirant, Alhaji Atiku Abubakar, said the PDP is on a mission to rescue Nigeria from insecurity and other challenges confronting it. Other national leaders who restated the readiness of the PDP to take over power at the centre are former national Caretaker Chairman and ex-Kaduna State Governor, Alhaji Ahmed Makarfi; former Sokoto State Governor, Alhaji Attahiru Bafarawa; former Jigawa State Governor, Alhaji Sule Lamido; former Niger State Governor, Dr. Babangida Aliyu and Chairman, Board of Trustees, Senator Walid Jibrin. Atiku, Makarfi, Lamido and Bafarawa addressed the rally in their capacity as presidential aspirants. 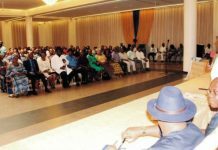 Atiku urged the people of Ekiti to vote continuity as represented by Olusola, who is seeking to succeed his boss, Governor Ayo Fayose, in the July 14 election. He said: “The people of Ekiti, I have known you since 1992; all the projects completed and taken Ekiti to higher level have been done by PDP alone. “PDP guarantees you good hospital, road, infrastructure, education and many other dividends of democracy, it is time for you to ensure that this administration continues because that is the key to development. 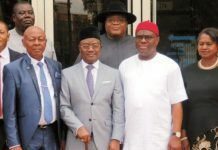 Secondus said: “The PDP is rebranded and repositioned; we are here to rescue Nigeria from insecurity, from collapse and from hardship Nigerians are presently going through under the APC government. “We refuse to be intimidated, it is their style to intimidate. Thus country is experiencing civil war because of killing and Buhari is behind it, APC is behind it, PDP will take over. 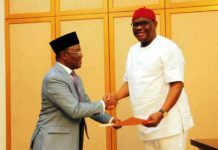 Chairman of the PDP National Campaign Council and Akwa Ibom State Governor Udom Emmanuel said Nigerians are tired of APC leadership and are ready to vote out the broom party. Emmanuel claimed that it is only PDP states that things are working urging Ekiti residents to vote continuity and give their votes to Olusola. Other PDP governors who canvassed for votes for Olusola include Alhaji Ibrahim Dankwambo (Gombe), Mr. Dave Umahi (Ebonyi), Mr. Daris Ishaku (Taraba), Prof. Ben Ayade (Cross River), Dr. Okezie Ikpeazu (Abia), Dr. Ifeanyi Okowa (Delta), and Bayelsa State Governor, Chiefr Seriake Dickson (Bayelsa) represented by his deputy, Rear Admiral Gboribiogha Jonah (rtd). Other prominent party leaders who attended the rally include former Anambra State Governor, Mr. Peter Obi; former Ogun State Governor, Otunba Gbenga Daniel; National Vice Chairman (Southwest), Dr. Eddy Olafeso, members of the National Working Committee and members of the Zonal Working Committee. Host Governor Fayose accused the APC of planning to the rig the governorship poll but maintained that the people of the state are ready to resist any attempt to manipulate the poll. He alleged that the intimidation ahead of the election had started with the alleged closure of the Akure Airport to prevent governors and other party leaders from attending the rally. “We knew what you did in Kogi, we knew what you did in Ondo, we know your plan. Whether APC resort to violence or not, Kolapo Olusola will be declared governor-elect of Ekiti State, Nigeria. Fayose added: “Since Monday, they have been arresting PDP people, they arrested three teachers. In this election, it will be 16-0, it will be 16-0 again, the 16-0 is loading. “I got a letter on Wednesday that that I should come and welcome the President but I said I am not receiving the President because he has not done anything for Ekiti. 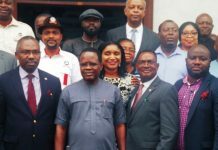 Speaking after receiving the flag, Olusola, who was flanked by his wife, Janet, expressed confidence that he will win the election and will be declared governor-elect. Olusola said: “By the grace of Almighty God, we assure our leaders and Ekiti that we will sustain the good legacies of Fayose, we will improve on it and sustain the legacies. “I assure you of adequate security, healthcare, excellent infrastructure, civil service, education enterprises, and exemplary leadership among others. “Ours is a divine agenda. It is a divine mission with divine agenda it cannot be conquered by APC. Congratulations Ekiti, your governor elect is talking.